The Grand Luxxe has finally come to the Riviera Maya resort. We can give you the Grand Luxxe experience as the guest of an owner. You won't believe it. No big line at check in. Instead you get invited to sit in a comfy chair for a relaxed check in. You are offered a welcome beverage. A margarita seems most appropriate to us, but there are other choices as well. The check in process is casual and comfortable. When you arrive at your room, your dedicated floor concierge (for just eight units) shows you through your unit and explains the amenities and asks what time you would like your complimentary coffee in the morning. All the various types of Luxxe units are simply enormous and equipped with flat screen televisions in each room, multiple heads in the shower, a soaking tub for relaxing. Of course, like all Mayan faciliites, the kithcen is supplied with all the requirements for cooking. A lightly heated cooling pool enhances the beautiful hardwood deck that serves and an additional living area. Most of the views are of the jungle, but the exclusive Luxxe pool area is right on the beach with restaurant service at poolside. High definition DVD players with rental movies and also family board games are available from the concierge. 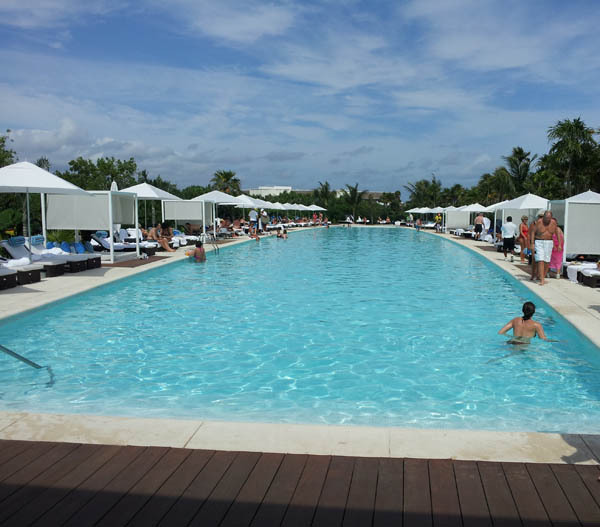 If you have stayed in the Grand Mayan, you will notice some benefits when you head down to the Grand Luxxe pool area. First of all, there are no towel cards, just towels available everywhere. Next, there are the activities people who come up and clean your sunglasses or offer you a small popsicle when they are not busy with activities. Where is the Grand Luxxe? The only catch is that availability is currently somewhat limited due to the popularity. Oh and the prices are higher for all this luxury. Please plan as far ahead as possible.